Click on the image or link above to open our printable order form. 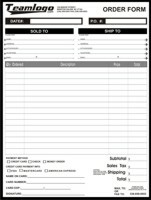 You can use this order form to order by fax or mail using payments with credit cards, money orders or checks. Please note that orders with personal or company checks may be held for up to 14 days until it clears the bank. To open and print our order form you will need to have Adobe Acrobat Reader installed on your computer. This is a free download from Adobe. Use this link http://www.adobe.com/products/acrobat/readstep2.html to located and download this free software from Adobe.